"This morning was awesome! Well done ladies! I also wanted to tell you the program launch at Mesquite today went very well. I was handing out stickers and kids were so excited, but there was another amazing thing that we all noticed...the custodians did not have to empty the garbage until after the third lunch - they usually empty after each lunch. It's wonderful to see more food going into students and less going into the garbage. Where can I buy these things??? My daughter brought hers home from school yesterday and insisted that I wipe everything off after dinner of it so we can reuse it at every meal. I don't know if you all did this from your own gut instinct or had a child psychologist help, but it really got in her brain. If we cannot get more of the paper version we will have to go to the ceramic shop and paint some. Her bad diet is a major obsession for her grandparents and her aunt, so maybe this can even bring family peace. We have all, as children and adults, played with our food at different times. What a great idea Kristan and Susan have come up with to educate our students about how healthy food can be fun. Their enthusiasm creates excitement that will make this program jump onto your students' plates. 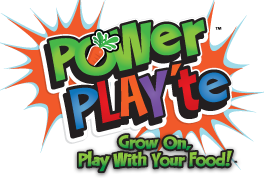 Students will have fun while learning the benefits of good nutritional practices. What a great way to help America become stronger. This is one of the best educational ideas I have heard of in 40 years of teaching and being on a school board.